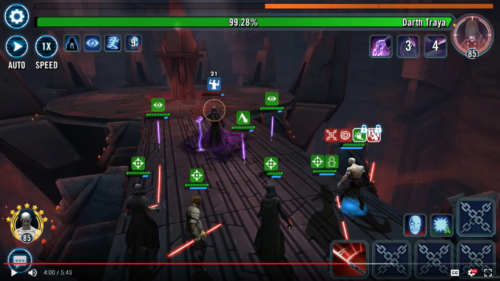 The Sith Triumvirate Raid burst onto the scene of Star Wars Galaxy of Heroes first as a hints on the forums, then as presentations to myself and my fellow GameChangers in Sacramento, then finally as a playable event on March 1st, 2018. This content took months to develop by EA Capital Games and features seven tiers of competition. There is one thing that we know about this event – it is hard and was intended to be incredibly challenging for players at all levels in the game. As a result the phrase “STR fatigue” has popped up across the SWGoH community on many occasions. Due to my overall enjoyment of this game, the fact that a Raid that is constantly available to play does not bother me, but I can relate to those who feel pressured and even overwhelmed by this. On one hand you have players like myself who login multiple times a day looking for something to do between tasks, and on the other hand you have casual players and those who are more than casual, oftentimes because of longevity in the game or due to a connection to a Guild that they do not want to let down. Whichever type of player you are, you are here because you want to get more out of the Sith Triumvirate Raid – on the scoreboard. While my original intention was that this will be for the 99% of you NOT fighting the Heroic STR, I know from my own tests and from watching videos that many of these teams translate well to the Heroic STR as well. So consider this a Guide for the Sith Triumvirate Raid as a whole – not just the Heroic or non-Heroic versions. The following guide has been put together after weeks or research and the testing of multiple teams in each phase both in my personal and dev/QA accounts, and it has been updated in November 2018 by SWGoH GameChanger Skelturix. As originated, this document is intended to be a living, breathing piece of writing which will evolve as the Sith Triumvirate Raid evolves, so if you have items to add to it comment or message us here on the site or @GamingFansDFN on Twitter.